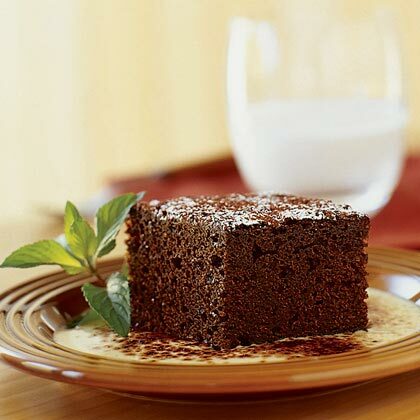 This dark, moist gingerbread cake is a favorite of guests at the Vista Verde Ranch in Steamboat Springs, Colorado, where it's cut into rounds and set on a pool of custard sauce. You can make the cake up to 2 days ahead; cool, cover, and store airtight at room temperature. Pour about 1/4 cup crème anglaise onto each plate. Cut cake into pieces (see notes) and set them in sauce on plates. If desired, lightly sift cocoa and/or powdered sugar over each plate and garnish with a mint sprig. Offer remaining crème anglaise to add to taste.